On a sunny sunday afternoon, you hear the faint sound of music playing somewhere in the distance. You decide to hop on your bike and ride. Eventually, you will end up in a mass of dancing people. Who needs TomTom anyway? OMWAT (short for ‘Oh Music, Where Art Thou?’) is a navigation application for mobile devices that guides users by utilizing their natural ability to localize a source of sound. Think of the way in which you’re able to find a band playing music, just by listening to where the sound comes from. 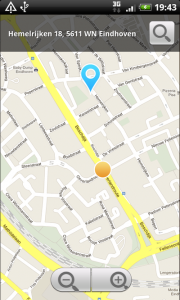 Users can select or search a destination from the map, or pick one of the stored favorite locations. The user then selects which of his/her favorite music (s)he wants to listen to and (s)he’s already good to go! The phone can be kept safely in the user’s pocket, there’s no need to look on the screen while navigating. Using visual cues for navigation provides a large amount of information in an efficient way. This is the main reason why most navigational systems currently on the market use this technique. There are several problems with this method, however. A main problem is that this way of informing users distracts them from their main activity, like driving a car or riding a bike. 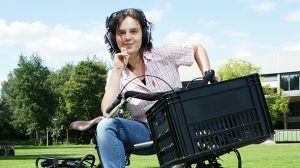 We decided to explore the possibilities of audio-based navigation for byciclists. The navigation should be more efficient and safer than existing solutions. We decided to create a system that provides not turn-by-turn navigation cues, but instead makes use of an existing paradigm. A natural way for humans to navigate towards a destination, is to follow the direction of a sound source. Because of the high accuracy of the human aural system, even blindfolded people can precisely determine the direction from which a sound originates. 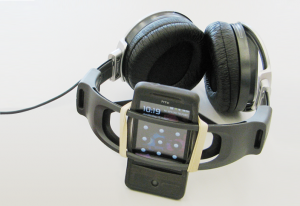 The prototype design featured a smartphone mounted on a pair of headphones. The smartphone calculated the virtual location of the destination by means of its GPS-sensor and magnetometer. 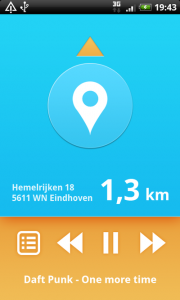 The user could playback music of his/her choice on the smartphone, while the balance of the outputted sound was shifted towards the direction of the destination. This enabled hands-free and unobtrusive navigation for pedestrians and byciclists. We evaluated the system in a small user test, in which users were asked to navigate to an undisclosed location somewhere in Eindhoven’s city center. It turned out that users were able to find their destination with remarkably accuracy and almost no detours. A couple of months after the initial Oh Music, Where Art Thou? project had been completed, it was presented at the MobileHCI 2011 conference in Stockholm, Sweden. The project attracted huge amounts of media, so we decided to convert it from prototype to product. A wealth of (inter)national media has covered the presentation of our concept: gadget- and tech-blogs, newspapers, radio and television; all of it. The huge amount of media attention did not remain unnoticed; soon we were invited to show our project during Dutch Design Week (DDW) 2011. By this time, we had successfully created a full-blown smartphone application which has been released in the Android Market. The audience of the ID’11 exposition on the Dutch Design Week awarded our app the ‘best of show’ award. 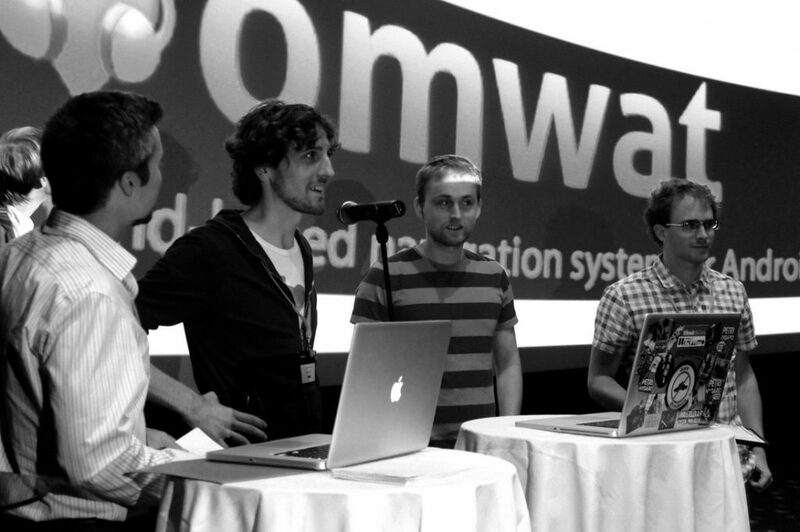 In addition, OMWAT has won the 2nd prize in the Nokia Ubimedia Mindtrek award, yearly awarded to projects combining ubiquitous computing and media.